Our sarouels are a look apart and a step beyond the ordinary -- beckoning your inner Scheherazade! Whether you stride like Athena or dance like Salom�, this extraordinary design allows you all the movement of a skirt with the easy and comfort of pants! 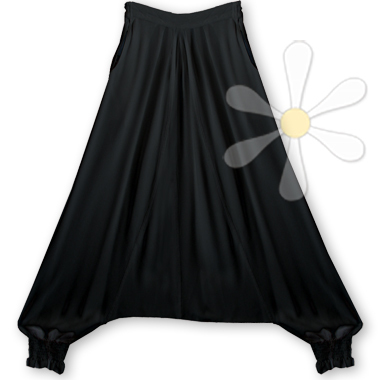 These extra-wide harem pants with long, low inseam are worn from Morocco to Egypt, Anatolia to India, Japan to Thailand. What do they know that we don't? Could it be that comfort trumps way-too-tight jeans? That in the west we are so obsessively body-conscious we favor constraint and restriction? Free yourself with the ease and comfort of a skirt with the coziness of pants... You're the artist, be your own canvas, say exactly who you are, every day!